The Archbishop Iakovos Library and Learning Resource Center serves Hellenic College Holy Cross and the greater academic and religious community by supporting the curricula of the undergraduate college and the master’s level theological and seminary programs and by offering research materials for scholarly work. The Library’s resources are housed in the Archbishop Iakovos Library and the adjoining Cotsidas-Tonna Library. Principal collections include acquisitions in Orthodox theology, Classics, Byzantine history, and Modern Greek studies. The Library houses over 60,000 monographic volumes, over 300 active serial titles in print, numerous digital resources, and a large number of audio-visual materials. In addition, the holdings of the Library include a rare book collection in Orthodox, Greek, and general religious studies, as well as an archive of materials related to the history of the school and of the Greek Orthodox Archdiocese of America. The top floor of the library contains the permanent exhibition of the Archbishop Iakovos Collection. 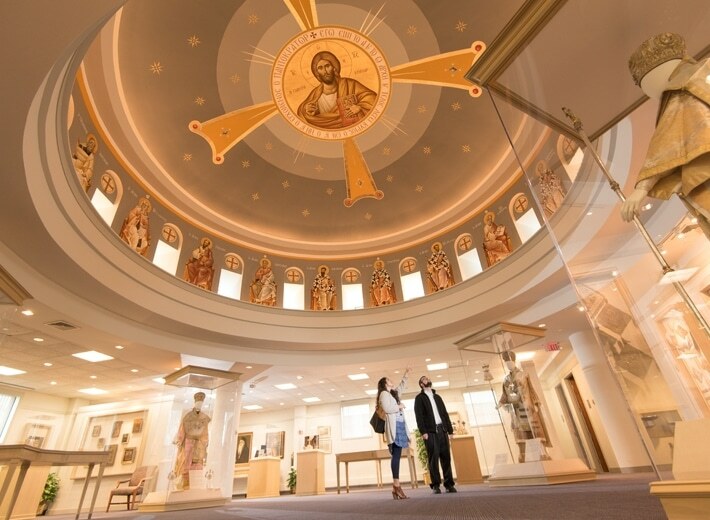 Located on the top floor of the Library, The Archbishop Iakovos Collection is a permanent exhibition, installed under the direction of His Grace Bishop Andonios of Phasiane. The objects displayed constitute the personal effects of His Eminence Archbishop Iakovos that reflect the 37 years (1959-1996) of his archpastoral ministry and leadership of the Greek Orthodox Archdiocese of North and South America. Most of the objects within this Collection belong to the post-Byzantine and modern periods. A brief description of this Collection and its significance can be found in The Archbishop Iakovos Collection brochure, prepared by Bishop Andonios. More recently, a number of Greek, Roman and Byzantine pieces that had belonged to Archbishop Iakovos were transferred to the Collection. These objects were first put on exhibition for the School’s hosting of the 38th Annual Byzantine Studies Conference, November 1-4, 2012, and will remain on permanent display as part of the Archbishop Iakovos Collection. Information concerning these objects can be accessed from the digital catalog. In the near future, Archbishop Iakovos’ archive will also be maintained here. Individual and group tours are offered Monday-Friday, 9am-5pm, or by appointment. While the Library primarily serves the needs of the faculty, staff, and students of Hellenic College Holy Cross, it is also open to and available for use by the larger community. Upon entering the Library, all visitors must fill out a Visitor Registration Form at the Circulation Desk. Visitors may not check out library materials without special permission. Please speak with the Director of the Library for more information.